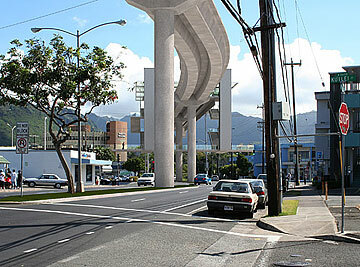 This photo-illustration shows what a proposed rail transit structure would look like along University Avenue. There will be winners -- and losers -- in today's historic City Council vote to choose a final mass transit route. Some communities, including Ewa Beach, Salt Lake and even Waikiki, have lobbied hard to be part of the route, which is expected to cost taxpayers billions of dollars. So have Waipahu, Kalihi and Ala Moana Center, which are likely to be a part of it. But no matter what happens, a great deal is riding on today's vote -- including ridership, federal funding, economic development, housing and redevelopment options. And, ultimately, the only reason for building it: traffic relief. The Council is scheduled to vote today on Bill 79, which selects the city's mass transit system and route to satisfy a federal requirement of choosing a locally preferred transit alternative. The biggest fight is centered on the selection of the western end of the route, part of a 28-mile line that is estimated to cost at least $4.6 billion. It would connect West Kapolei to the University of Hawaii at Manoa, with a possible branch line to Waikiki. BUT HOW THAT line gets to UH from the west side has generated a great deal of controversy, with some supporting a more direct, and less expensive, line above Kapolei and Ewa, and others supporting a line south via Kalaeloa and the planned North-South Road, traversing the Ewa plain. The Council so far has chosen the more northerly route -- known as the yellow line in planning documents -- while the mayor, the region's politicians, residents and developers are lobbying for a so-called green line that would provide better access to Ewa residents but could cost more. Ewa Beach residents might get no relief, green-line supporters say, if the yellow line were approved because they would still have to battle heavy traffic just to get to the stations along the H-1 freeway. "I think everybody recognizes the 45-minute drive up Fort Weaver Road at 5:30 in the morning is not acceptable," said Micah Kane, director of the state Department of Hawaiian Home Lands, which has housing and commercial developments planned for the region. "If you run it the right way, the people from Ewa don't have to go up to the freeway," said area Councilman Todd Apo, who has introduced an amendment calling for the green line to be approved. The green line would provide residents with a more direct shot, supporters say, to the transit line via Kapolei Parkway to a major shopping center being developed on DHHL property. This property could become a major transit hub with park-and-ride lots. Another concern is the Kroc Community Center, which is being planned along the North-South Road property. "That's a $110 million gift to the state of Hawaii, which is targeting low-income families and children and ... enough of a reason to come down North-South," Kane said. "It's that important. It will impact thousands of children every single day for generations to come." Kane said the DHHL developments being planned for the region are aimed at providing live-work opportunities and a rail transit system. While some on the Council are calling for the state to cough up more funding to build the transit route, Kane said DHHL does not have the kind of resources to develop a transit connection to the yellow line. 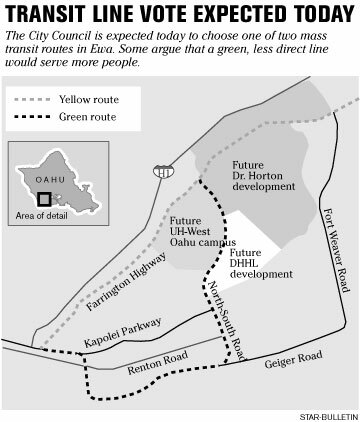 And the University of Hawaii's West Oahu campus might have to go back to the drawing board if the yellow line is chosen. Apo said that much of the plans for the campus -- expected to open in 2009 -- is designed around a transit stop on North-South Road. "They would have to, I think, basically scrap their existing plans," Apo said. THE BIGGEST winners of the city's mass transit plans will likely be those who are along the minimum operable segment, the first leg of the transit line within the longer 28-mile route that the federal government is expected to fund. Some have argued that a proposed 20-mile route from East Kapolei to Ala Moana Center would make the best first segment because the mayor has said the city has enough money to build it. Hannemann, however, said he has not decided on where the first segment would begin and end, but wants it to start as far west as possible. He also wants to break ground in 2009 with the first six to 10 miles completed and running by 2012. Bill 79 also mandates that the Council approve that first segment. The owners of Ward Centers and Ala Moana Center will likely be big winners. Ala Moana especially will act -- as it does now with city buses -- as a major transit hub. "A lot of people go there just to transfer. If the rail line goes there, it's a natural activity center," said Councilman Gary Okino. "If we can at least go there initially, it would be quick transfers to areas like UH or Waikiki and expand the line further." That is important because the transit system is not likely to serve the University of Hawaii and Waikiki directly at first. Plans call for a beefed-up shuttle system between the shopping center and the UH campus and Waikiki. Students, faculty and university officials have lobbied the city hard to designate the Manoa campus as a stop. But whether the mass transit system actually goes through Waikiki is still being debated. Residents and hoteliers are opposed, but hotel workers who have to travel from other communities to get to work testified that a lack of parking makes getting to work difficult. Because Ala Moana is in the midst of expanding the center now, it is a perfect opportunity to meld the city's transit plans, officials said. "If we work with Ala Moana, I think we can fix some of the roadways, widen it for buses so we can have a good interface," Okino said. "We could even build a station right into the shopping center." OTHER EXPECTED WINNERS along the route will be neighborhoods like Waipahu and Kalihi that can add riders to the transit line while creating redevelopment opportunities. "Kalihi and Waipahu would benefit big time -- that could be the spark to revitalization," Okino said. Others potentially see Salt Lake on the losing end of the debate over whether the route should go through that neighborhood or through the job centers of Pearl Harbor, Hickam and the airport. "That debate is not really a debate because we punted and left it up to the administration, and the administration is going to decide the airport," said Councilman Charles Djou.